Amid increasing anti-Islam propaganda worldwide, a council of elite Muslim scholars met in Abu Dhabi, discussing methods of renovating Islamic education and developing a new strategy to send peace delegations to global hotspots “to stop the game of death”. The Muslim Council of Elders met in the Emirati capital to discuss ways to modernize the way Islam is taught in schools to fight misconceptions. The meeting, held last Thursday, discussed methods to improve interfaith dialogues, including sending peace delegations to global hotspots “to stop the game of death”. 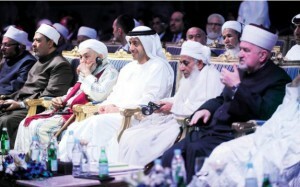 Abdullah bin Bayyah, president of the Forum for Promoting Peace in Muslim Societies, said delegations would be sent to areas of conflict to correct misunderstandings of Shari`ah and explain that these “bloodbaths” benefited no one. He added that it is the job of scholars, intellects, universities and good politicians to act as “firefighters in this deadly atmosphere”. “Many of the disputes that we think of as internal are in fact due to foreign interference, so it requires two things: to talk to the doers on the land and those behind them,” Mr bin Bayyah said. Fasting is to be at peace. If someone tries to bother us, we can answer quietly: “I am fasting. “The concept of peace in Islam is central, in addition to being one of the beautiful names of God, Salam, the importance of which is at least equal to Rahman, the Merciful. Indeed, secularism and human rights are affirmed. The friendship between human beings in general and in particular between the “People of the Book,” the monotheistic brothers who recognize Abraham, is fundamental. In Islam, the recognition of the right of difference is essential. In addition, the secular dimension is recognized. We can say that the sky does not over-ride the earth: man is not bound by faith, but, on the contrary, he is accountable. Revelation leaves open spaces where the responsibility of the Muslim can and must assert itself. Each of us is required to examine our own conscience and contribute to the culture of peace. The conduct of the Muslim, especially during Ramadan, instead of falling into error, should be shaped by the concept of peace and justice. The insistence of the Qur’an about justice, fairness and equality should make Muslims sensitive to these dimensions as essential to our social relations. The character, mind and behavior of Muslims can only be profoundly marked by the imperative of justice. A Muslim is not fully a believer until he applies justice and equity. To be a righteous man is of major importance in the Qur’an. It remains to measure the distance between the principle of justice in everyday practice, and the search to understand the real causes of deviations. The Qur’an addresses humanity, the last sura repeated five times the concept of humanity, people, beings. Revelation is the people as a whole. We must never be opposed to difference, but we must oppose injustice. In the Qur’an, everyone is free and responsible for his actions. Nobody can boast of irresponsibility or unconsciousness. For most of the themes and issues, the Qur’an makes it easy to take into account the variety of situations and allows us freedoms to reflect, discern, adapt and evolve. Its provisions favor the conditions of justice and coexistence, change and metamorphosis, and it helps us distinguish right from wrong, the lawful and the unlawful, so that we may be good citizens. The exegesis of texts must be based on adequate knowledge of scientific and linguistic rules, ethical and fundamental knowledge and values. Any interpretation should facilitate rather than complicate. It should not contradict healthy reason or violate firmly established scientific facts. While making the efforts of research and reflection, pushing deconstruction, searching for truth and right opinion, one should be detached from one’s own passions and preferences. The generic word, ijtihad, thus refers to the principle of free and responsible thinking which is demanded of competent intellectuals so that we can participate in the renewal and invention of new concepts, new practices, and interpretation of the Qur’anic discourse and Sunnah adapted to our time. This aspect makes ijtihad open to evolution and responsive to the interests of individuals and societies, accommodating all times and all places.